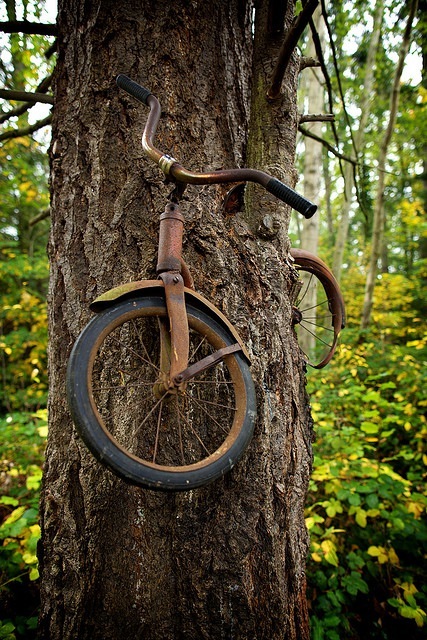 The story behind this surreal image is that in 1914 a boy left his bike chained to a tree, then went to war and then never returned. As it is writer Wednesday, let’s use this as a writing prompt and create something even more awesome. Write a micro fiction (100 words or less) about what really happened to the bike. Best entry wins a mini-featurette to be posted next week! Entry must be posted in the comments no later than Friday, July 10, 2015. Entry must be 100 words or less, not including the title. Have fun and keep it PG13 or less. This entry was posted in Writer Wednesday and tagged contest, fiction writing, micro fiction, prize, writing, writing contest by Jodi. Bookmark the permalink.